It’s the name of his soon-to-be-released album, but it’s also an idea that Chris Robley expresses through music. A musical artist is a Make-Believer, a pretender if you will…playing a part in order to communicate emotion and experience through lyrics, melody, instrumentation, and performance. Chris, in his week-long residency at McMenamin’s Al’s Den, became very “real” to Portland, as he shared more than his music with the audience. 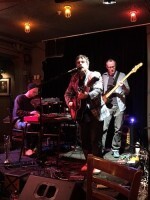 He shared his story and his life, even his friends with a very enthusiastic and energetic group of devoted fans. 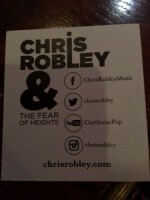 Chris’ work with his band The Fear of Heights is well-known and appreciated for the many layers of instruments with an eerie, haunting sound that accompanies some of the purest vocals I’ve ever heard. His new project is more of an intimate conversation with listeners – each new song has a personal message. 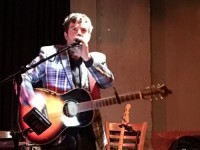 He’s a poet, intensely metaphorical, so the songs are not autobiographical – but they are overflowing with situational wisdom. I am always drawn to songs that expose the truth that “love is difficult” and “relationships are important.” I heard this message repeated in Robley’s lyrics and his stories. He is striving to let the message come through in the music, unhindered by anything extra that might distract or take away from the melodic conversation he is having with a listener. His acoustic presentation was enchanting, as he alternated his original songs with some very familiar and traditional tunes. The new album, available to the public very soon, was produced at a friend’s beach house – completely live and in the moment. Chris was looking for the emotional intensity that comes from a group of mates experiencing music together, and syncing as they work. It’s a completely new approach for Chris, for this, his first album release in over five years. From the reaction of the audience, which was extremely positive and encouraging, he is reaching people with the new material. 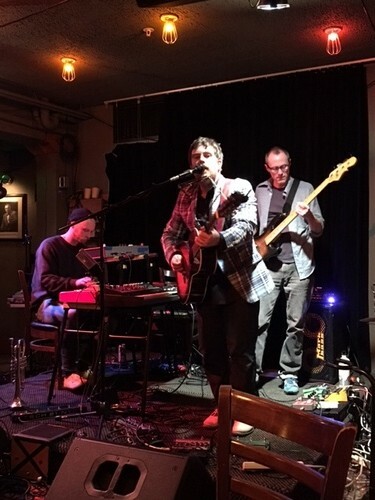 In this interview, Chris touches on his move “from Portland to Portland”, his upcoming album release, and the bandmates he is so thrilled to see again – big thanks to Chris Robley and his Wednesday night guest, Little Professor, for allowing us to share the experience!